The penultimate round of the French Elite Motocross championship was a great one for team Rockstar Bud Racing Kawasaki, who dominates both classes. Winner of the MX2 classification Dylan Ferrandis is strongly leading the ‘Internationaux de France’ while Greg Aranda claimed his first double win this season in the MX1 class. 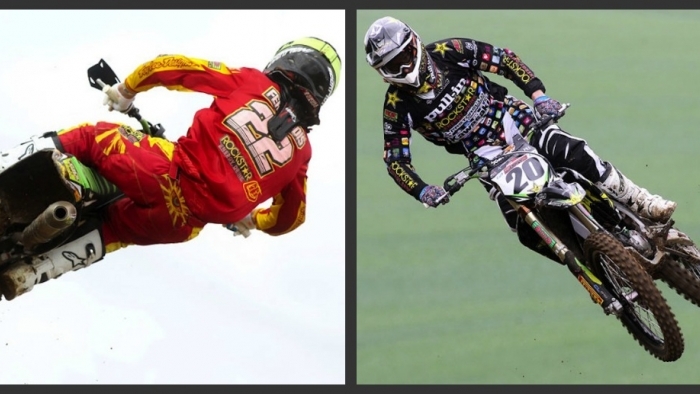 Nobody was able to ride with the Bud riders this weekend, as Dylan and Greg didn’t let anything to their rivals. Best lap time during the practice session, holeshot and all the heat wins were for Greg and Dylan in Saint Jean d’Angely! Fastest rider in the timed practice period, Dylan Ferrandis had a quiet MX2 race. He grabbed the holeshot and then controls Benoit Paturel, taking even more advantage when they joined the lapped riders to win the heat twenty seconds ahead his rival. Very confident before the super final he had some strong moves after the start to come in fourth place; he passed Paturel for third, and then reduced the gap with Fabien Izoird on a 450. He passed him after mid race to finish runner up behind Aranda and best MX2 rider. Back to his best form and pole position in the MX1 class, Gregory Aranda had dreaming starts in both races, MX1 heat and super final. Leading the race in the first corner Greg posted some fast laps to secure his leadership; in the MX1 race Soubeyras who was second crashed, so Greg could save some energy for the super final; once more leader in the first corner he had no opposition in this race and scored his first double win this season. A great reward after his injuries earlier this season, and an encouraging performance for the coming Euro Supercross season.